Tradestone Gallery and Lacquerbox.com present their third in a series of high quality gicl�e prints, all taken from the artwork of notable and original Russian lacquer boxes. With this print, the very creative and original Palekh artist Tatyana Smirnova captures the joy and wonder of two children watching the first snowfall of the year. A colorful bird flies across the sky, adding a touch of drama to the scene. This miniature comes across very well as a larger-scale print, where it is easy to appreciate the the detail of the two children's faces. Smirnova used little touches of aluminum paint to create the silvery snowflakes, and the print gives a good idea of the texture of these. The print looks very nice framed and matted, and because of its shape it fits nicely in narrow nooks and corners. The artist herself has authorized this limited edition of 200 prints, and each one comes with a signed, numbered certificate. The print measures approximately 7" x 15", and comes unframed and unmatted. Prints come unframed and unmatted. The above is only one suggested way to display it. 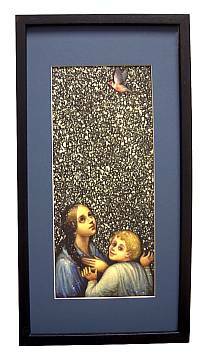 The frame that you see measures 10" X 20", a size available in arts and crafts stores.